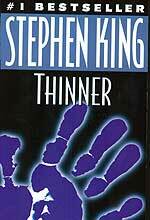 In the case of THINNER, the axiom proves true, though – an excellent tale penned by King (his last under his pseudonym Richard Bachman) that cannot be ruined even by filmmakers who can’t quite get a fat suit right. In this production, which sometimes feels like a TV movie, where the acting is occasionally iffy, where the makeup looks rubbery, where the casting feels stunt-y – we can’t wait to see what happens next! Obese small-town lawyer Billy Halleck (Robert John Burke) accidentally runs down an old gypsy woman, killing her. Though he was drunk at the time, and his wife (Lucinda Jenney) was giving him head (which accounts for the idiotic R-rating), the kangaroo court overseen by Billy’s friends (judge and policeman) exonerates him of all charges, its view of the gypsies one of contempt anyway. So begins fat Billy’s inexplicable weight loss, at first a welcome achievement, but then, continuing past his optimal weight, continuing past stuffing his face to avoid anorexia, continuing past medical intervention, until he is a husk of skin and bone about to collapse from malnutrition. Billy deduces it is the gypsy curse that will eventually snuff him out of existence. As he slowly loses his mind, he chases down the gypsy Lempke to beg him to lift the curse. That’s a big Scandinavian no. Billy also suspects his wife has started an affair, as his behavior has become more unbalanced. He becomes a recluse in the woods, and calls in a favor from an old gangster client, Richie (Joe Mantegna, doing his best Joey Zaza), to strong-arm the gypsies into lifting the curse. Richie enables desperate and frantic Billy to aim a curse right back at the gypsies – the curse of the White Man From Town. Which is simply good ole gangster methodology: poisoning their dogs, killing their sons and terrorizing their hot wanton wenches (Kari Wuhrer as Tadzu’s granddaughter, ripe for the picking, knowing it, flaunting it, loving it). Burke’s performance is outstanding, as we see him slowly losing his mind as he loses his weight, even outacting the different fat suits that never quite look like his gunt; while Joe Mantegna just seems miscast, even though his presence makes us stand up and cheer as someone with a sure grasp of resolving Billy’s fatal curse. Once again I will mention that odd thing about bringing magic into a story. Magic is turning Billy into a skeleton, magic is also turning the judge into a lizard and the cop into a leper, yet Lempke couldn’t work dat ole black magic to save his run-over daughter? That’s the problem whenever magic is used – no boundaries, no rules. Whenever it is used to drive a plot, that same magic could be used to defuse that same plot. So when Billy puts the White Man curse on the gypsies, it is as logical as the curse put on him, meaning they are both illogical, yet if both parties place belief in that illogic, it’s as real as Santa Claus in a Christmas movie. The resolution is as blackly funny as it is disturbingly tasty. Lempke gives Billy a cherry pie to bleed the curse into… and Billy takes it back home, where everyone – the wife, the lover, the daughter, and Billy himself – gets their just desserts. And I do mean desserts. Literally. (Not the tale – but he who tells it…) Oh Stephen King, such a tale you tell, you sassy lassy! Writers: Stephen King, Michael McDowell, Tom Holland. Starring: Robert John Burke, Joe Mantegna, Lucinda Jenney, Michael Constantine, Kari Wuhrer, Bethany Joy Lenz, Time Winters, Howard Erskine, Terence Kava.